I think people are finally starting to change their minds about what’s considered healthy. At least, search I hope they are. For me, illness it’s not about low-cal and low-fat and no-fat, but more about keeping refined and processed foods to a minimum. This means that I no longer keep white flour or refined sugar in the house. Also, no margarine or other artificial fats. Instead, I’ve got organic butter and olive, walnut, peanut, sesame and canola oils. Whole wheat or grain flours are infinitely more satisfying than their bleached counterparts — there’s just no way you can eat 10 whole wheat cookies. Those 100-calorie packs? Well, I bet you can eat more than 10. Since white flour’s out, I usually have to tweak cookie recipes. My favorite substitute is oat flour, which I make at home by running some rolled oats through the food processor. 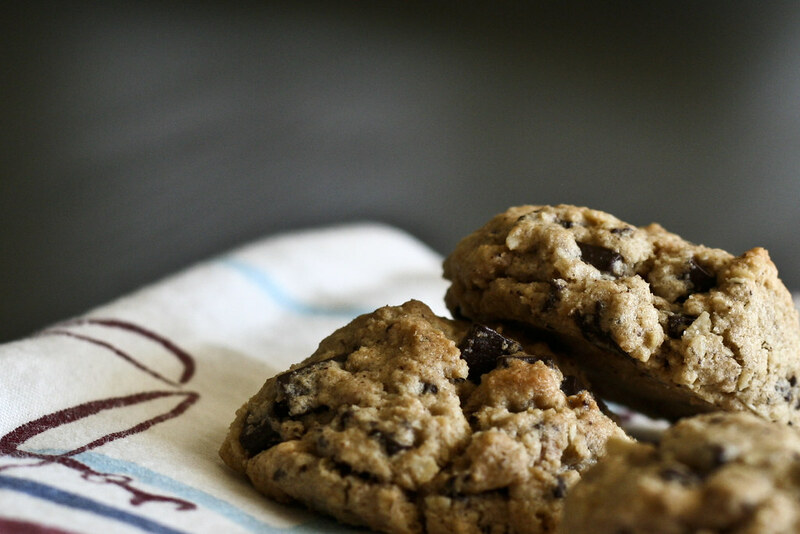 It gives cookies that chewy, homey oatmeal flavor that I absolutely love with dark chocolate chips. For this recipe, I also mixed in some grated chocolate which melts nicely throughout, and some chunky almond butter for crunch and, um, nuttiness. The result is a healthier cookie. Yep, cookies can be healthy even if they’re made with a stick of butter. Since they’re more nutritious, you only need a couple to satisfy your sweet tooth. And I promise no one will know they’re “healthy.” I actually gave these cookies to a big, burly fireman for his birthday and he gobbled them right up. I only told him they were good for him afterward. Special equipment: Stand or hand mixer. Preheat the oven to 375° and line 2 cookie sheets with parchment paper. Whisk the dry ingredients together until thoroughly combined. Next, cream the butter and the sugars together by whisking them with your mixer for 2 minutes, or until they become fluffy. Add the eggs and whisk for another minute, then add the vanilla and almond butter and whisk for 1 more minute. Combine the wet and dry ingredients, mixing with a large spoon or silicone spatula until the ingredients are well combined, then stir in the chocolate chips. Use a small spoon to scoop the dough and use your hands to form balls about 2 inches in diameter. Place the dough balls on the cookie sheet and flatten a little with your fingers. Bake for 10 minutes, then remove from the oven and let them cool for 10 minutes. Serve with ice-cold milk. 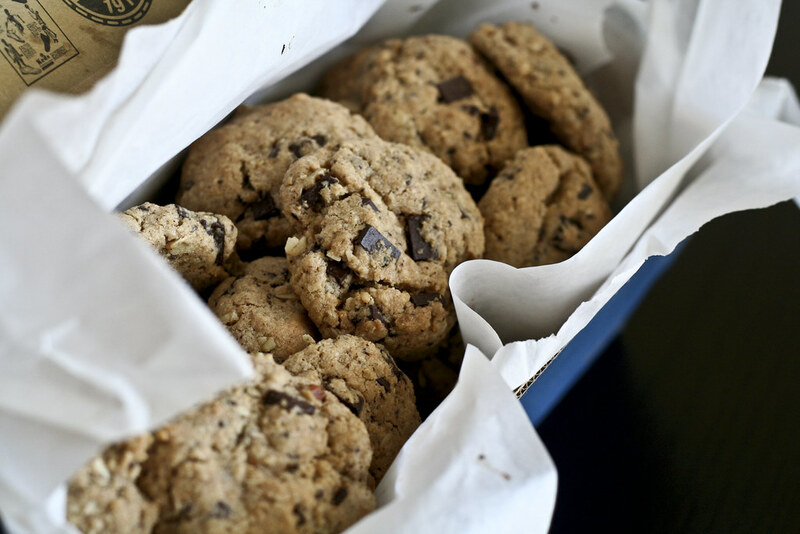 *To make Oat Flour, simply place 1.5 cups of rolled oats in a food processor and blend until they form a fine powder, though I like some oat pieces in my cookies. **Run some chocolate chips through the food processor right after you’ve ground your oats. I agree with your attitude towards healthy food completely! I try to bake with wholewheat flour but it’s still quite difficult to get the lightness (I don’t mind but my friends do!). Oat flour is a really good idea. Thanks Tommy – Have you tried White Whole Wheat flour? It has a bit of a lighter texture (and it’s not bleached). King Arther sells a good one. Yumm. These are wonderful. We’re currently on stage 2 of “Perfect Weight America” in my house. We’ll have to try this when we get to stage 3. We’ve got very similar healthy food philosophies here. I happened to read this just after buying a “No Cookie Cookie” out of curiosity last night. It’s SO good. There’s a choc chip, but this one is oatmeal raisin, and here are the ingredients: organic barley flour, Sucanat granulated cane juice, raisins, non-hydrogenated margarine (don’t know what this is), filtered water, oats, pineapple juice, soy lecithin, baking soda, spices, real vanilla. I’m also eliminating refined stuff. Cheers! Oh, I so need to read your blog more often–I need lots of help modifying my love of creamy, fluffy pastry and breads…and lots of cheese. These sound wonderful; I adore oats and almonds.Thanks! i had no chocolate, so i used a mixture of raisins and carob chips ( i know, lots of people are like ewww…carob. but i actually like it). dee-licious. the oat flour and chunky almond butter was just an awesome base for cookies! thanks mel! Yay Maggie! Glad they turned out well :) I like carob too, but I don’t think that would fly with Tom. Just came upon your site (via SeriousEats) – it’s great, and the photography is really beautiful. I’d love to make these cookies, but I have a quick question – the recipe calls for 1/4 cup/1 stick of butter. 1 stick of butter is actually 1/2 cup, so I’m assuming that’s what you meant…? Can you give me a little help with the measurements. What is .5 teaspoon of baking powder, what is .5 cup of cane sugar. Where can you buy chunky almond butter? Thanks. Jackie – .5 teaspoon of baking powder is 1/2 a teaspoon. You can find baking powder in the baking isle of your grocery store. .5 cup cane sugar is 1/2 cup of sugar. I like to use Florida Crystal Natural Cane Sugar because it’s less processed that white sugar, but you can use regular granulated sugar if you prefer. I get chunky Almond butter from Whole Foods, right next to the Peanut Butter. If you can’t find it, Chunky Peanut Butter is just as good and much easier to find! WOW – this recipe is fabulous! I played a little bit with the flour (1cup white wheat, 1 cup white and .5 cups oats) – they came out PERFECT! Just tried these cookies, and YUM! I did only have regular granulated sugar, which worked just as well. These might be my new favorites. YUMMY! These have now been added to my “favorites” and will surely become a staple around here…. Thanks so much! I love that these are healthy! Thanks for posting. My 7 and 3yr kids and I made these tonight, exact instructions. Im having a hard time keeping the cookies out the kids’ mouths.